I wasn't planning on doing much blogging over the next few days, but I had to put in a word on an uncommon act of guts that you don't see often, if ever: a newsperson taking on his own organization. I'm talking about Chris Clair, who blogs on hedge funds for Reuters, and who produced this item on Reuters spiking a story by Matt Goldstein on hedge fund fat cat Steven A. Cohen. That nasty little story was broken by Chris Roush at the blog Talking Biz News, who's been all over it like a cheap suit. I cannot reconcile these principles and what they represent with a decision to kill a story that, by all accounts I’ve read, was factually correct, relevant and timely. Worse, the decision at the very least appears to be connected to a complaint from the subject of the story to the highest levels of Reuters management. What to make of this? Reuters denies the story was spiked by pressure from Cohen, but the whole thing is troublesome. This reminds me of an incident that took place in 2001 at BusinessWeek. 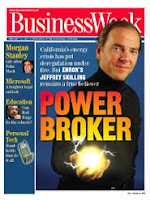 I was on book leave so I didn't personally witness it, but I was told by staffers later that BW killed a negative article on Enron. Instead it produced a favorable, and in hindsight embarrassing, cover story on crook-in-chief Jeff Skilling (left). Not a word of any of this leaked out until I wrote about it in Wall Street Versus America a few years ago. The difference is that this time the bad news is coming out, thanks to Chris Roush breaking this story, with a gutsy Reuters columnist taking on his own employer. Oh, and here's the irony: by blogging on this issue, and presumably surviving his doing so, Clair has actually done a smashing job of correcting (to some extent) whatever damage was done to Reuters' reputation by this incident. We newspeople, no matter how ferocious we may be to outsiders, have a tendency to be timid lambs in dealing with our own organizations. I think that's one of the reasons labor unions tend to be weakest at news organizations, when they exist at all -- an absence that contributed to the pain experienced during the cutbacks that we've seen this year. Not sure why that is, but that's the way it is, as Uncle Walter used to say. So it's nice to see an exception to the rule.